I can't find enough words to thank our soldiers and officers of our armed forces for safeguarding us. Every time there is a terrorist attack, a natural calamity or any other adverse situation they lead from the front without caring for their lives. It is their selfless sacrifices which gives power to the nation and maintains peace in the country. 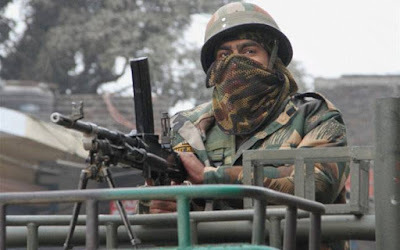 The military yet again proved its worth by neutralizing Pathankot Attacks in which group of heavily armed terrorists who attacked Pathankot Air Force Station (part of Western Air Command of Indian Air Force) were executed after a long battle of around four days. Seven soldiers (5 Defense Security Corps personnel, 1 IAF Garuda Commando and 1 National Security Guard) sacrificed their lives in killing six terrorists. Seven crucial lives were lost due to intelligence failure and lack of coordination among various defense agencies. It is not the first instance that terrorists entered by crossing Beas River on India-Pakistan border yet security was not tightened in that area. Why Punjab Police didn't take any action after the news of abduction of the superintendent of Punjab Police Salwinder Singh whose vehicle was captured by them to reach their destination. The recovery of dead body of a civilian driver also failed to alert Punjab Police about the seriousness of the situation. The Home minister behaved immaturely in briefing the media about the incident and the media also was not managed properly during the operation. It seemed that there was no coordination between the central government, home ministry, defense ministry and the commanders of the operation. Although the operation succeeded bravely thanks to our soldiers it exposed the NSG condition which hasn’t changed since 26/11 Mumbai Attacks of 2008. National Security Guard and other armed forces still lacks bullet proof jackets and state-of-the-art equipment promised to them after Mumbai Attacks. The media management we learned during that incident still appeared forgotten to me during this attack. Live reporting and continuous negative commentary by news channels created an atmosphere of fear, hatred and war among the citizen of the country. Why politicians considered life of soldier useless to not take security measures promptly? Why media is not managed by proper authority? Why government acted in haste to report the details of the operation to media? Narender Modi after coming in power not only broke the protocol but also broke the Indian government's stand to talk with Pakistan only after they stop sending terrorists to India. I am not questioning his actions however they failed to show any positive impact in relationship of India and Pakistan. For every terrorist attack India blame Pakistan and if you look at reports of Pakistan they blame India for such incidents in their country. There is distrust between these two countries which further widens in news channel debates and news paper editorials. Thus any actions which grab undue public attention should be avoided and official level talks should continue without media attentions in spite of such attacks which try to derail the peace process. Once again in the end I like to salute our soldiers whose bravery didn't get any mention in our political discourse and who are neglected by every political regime. I am leaving you with this song of courage of our soldiers 'Taakat Watan Ki Hum Se Hai' from the movie Prem Pujari. Brilliant write up...totally agree we are what we are because of innumerable souls guarding our homes silently. Its indeed unfortunate that much less has been done to safeguard their interest. This Pathankot incident was a sad one, among many other incidents. I agree with you point that Modi's establishing contacts with Pakistan against previous govt. prohibition didn't turn out well. And, this one was just worse case possible. PM Modi visits Pakistan's Nawaz Shariff on 12th Dec, and as a return gift we receive a terrorist attack. Our intelligence services again failed due to lack of efficient coordination. Disagree though, on media being managed by authority for it goes against freedom of expression.